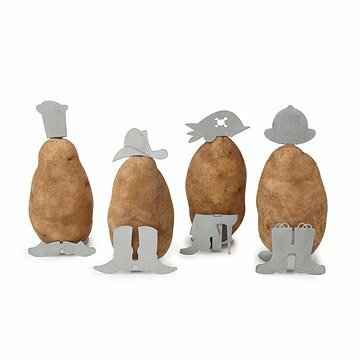 This set of metal hats and shoes adds personality to your baked potatoes and helps them cook more evenly. Baking a potato couldn't get much simpler—but there are still creative ways to make it better and more fun! That’s what these clever, spud-cooking accessories are for. Hidden behind the shoes and hats are metal points that pierce the potatoes. Because metal is an excellent conductor of heat, this allows the them to cook faster and more completely. Plus, when they're out of the oven, your kids or guests can choose whether they want their taters served dressed up as a chef, cowboy, pirate or firefighter! They work equally well with regular potatoes or yams, and they can be used in the oven or on the grill. Spud appetit! Made in China. Check out our Gift Lab to see the Potato People come to life! Would recommend for the person who has everything. I brought these to our annual holiday gift exchange and they were quite the hit, getting stolen several times. Everyone thought they were so cute, even for people without kids. Plus, they're functional, claiming to cook potatoes faster by keeping them upright, and they are grill-friendly as well. it created a good laugh! When my sister opened the gift she was laughing so hard! I think they're great for entertaining though. It adds a little kick to your party. so cute .. they can't wait to make bake potatoes with this item.